As you may know, electric cars are able to offer maximum torque from a standstill. While this may be helpful if you want to make a bank-robber’s getaway, it’s not ideal if your aim is to drive smoothly and easily around town in a small and nippy commuter car. Hence, I’m informed, the motor controller in the Think City EV has been designed to control the flow of energy from battery to wheels in a manner designed to mimic a petrol engine – with grunt peaking only after you’ve got underway. It works, too. As I thread the Think around the wriggling, dropped-spaghetti route of Millbrook’s city course I’m struck by how smooth and progressive the throttle action is. Top speed is around 68mph, but on this simulated rat-run it’s tough to get beyond forty. In its hemmed-in natural habitat, though, the Think feels quick and eager. Sadly the same cannot be said of its steering. Apparently it is power assisted but you could have fooled me – hauling the wheel from lock to lock feels like I might be winching some brass-helmeted diver up from the inky depths. Fortunately the brakes are more modestly weighted and are conventionally assisted – from time to time you’ll hear a pump running to keep the vacuum cylinder primed. The front brakes are discs and there’s also the reassurance of ABS if you are inclined to visit that 68mph top speed and need to stop in a hurry. ABS is a reminder that this is a proper car. 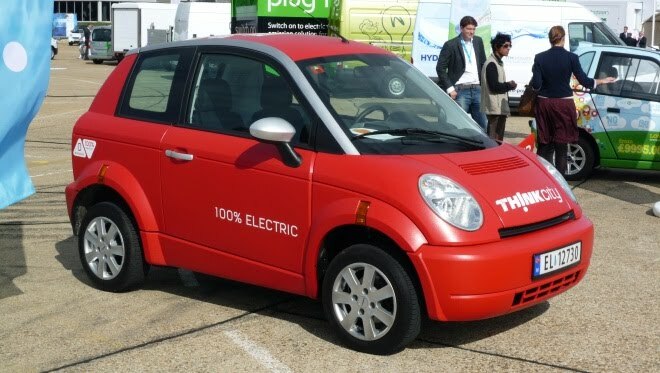 While its Fisher-Price proportions and plastic panels may give it the look of a G-Wiz-style quadricycle, the Think City has been crashed and certified to grown-up car standards. There are steel crumple zones front and rear, passenger and driver airbags, pre-tensioning seatbelts with force limiters, side-impact beams in the doors and a roll hoop in the roof. It doesn’t have a EuroNCAP star rating, but at least it won’t disintegrate like a Christmas bauble if you happen to strike something solid. Full car status means it will also qualify for the government’s plug-in car handout come January. Although the Think City hasn’t yet gone on sale in the UK, when it does it will cost about £24,000 before grant, or £19,000 after. About five grand cheaper than a Nissan Leaf, in other words. 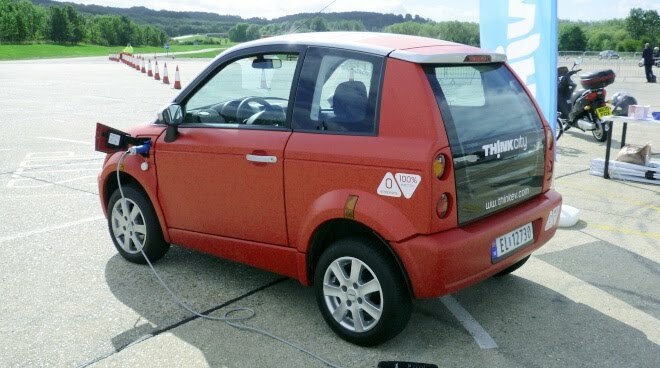 The left-hand-drive car I’m testing has a nickel-sodium battery, but right-hand-drive UK cars will come with lithium-ion batteries, I’m told, from early 2011. The two battery packs are very similar in weight and provide the same driving range – a maximum of about 100 miles between overnight charges. The car still rolls a bit around bends, even though the 250-odd kilos of battery are carried low, at axle-height under the front seats. I say front seats but the car I’m testing only has two seats, with a load bay behind stretching all the way to the glass hatch. Having a rear window that runs right down to bumper height certainly makes reversing simple. A 2+2 option will also be available. Out on the road there’s just the one forward ratio, accessed via a T-shaped shifter that offers park, reverse, neutral, drive and economy modes. Shifting from D to E can be done at any time and it brings a much more muted response from the throttle and more aggressive regeneration as you lift off. There’s a simple state-of-charge dial on the dashboard and if it drops to 15%, the car will automatically shift into economy mode to offer the best chance of limping home. In normal drive mode the regeneration with foot off the pedals is modest – unlike the Mini E, for example, you will need to use the brake to command significant regeneration, which will also bring a little conventional braking into play from the off. Apparently early Thinks used the actual brakes only if the stopping power asked for went beyond the maximum regeneration level, but this led to maintenance problems with rusty, unused discs in gently driven cars. At the end of my fifteen-minute test drive I’m impressed but a little less so than I’d expected to be. This car has been a long time coming to market and perhaps its moment has passed. The Think City feels like a solid little car but it falls a long way behind the Nissan Leaf, both in capability and conception. It’s a lot cheaper of course. But at £19,000, will it be cheap enough?